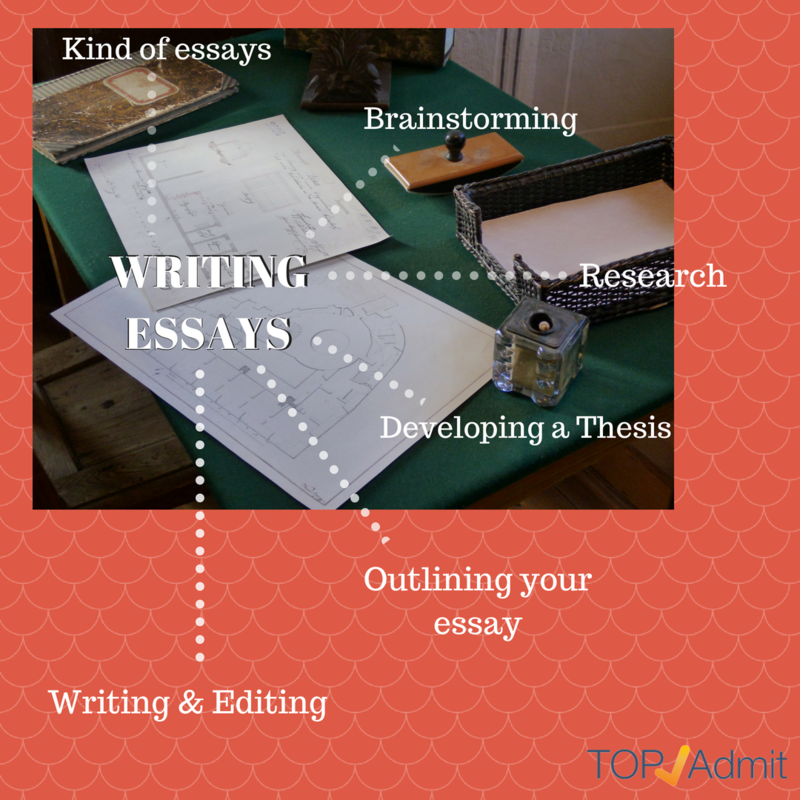 - Decide what kind of essay to write. - Edit your writing to check spelling and grammar. - Narrative Essays: Tell a story or impart information about your subject in a straightforward, orderly manner. - Descriptive Essays: Focus on the details of what is going on. For example, if you want to write a descriptive essay about your trip to the park, you would give great detail about what you experienced: how the grass felt beneath your feet, what the park benches looked like, and anything else the reader would need to feel as if he were there. - Persuasive Essay: Convince the reader of some point of view. - Comparative Essay: Compare two or more different things. - Expository Essay: Explain to the reader how to do a given process. You could, for example, write an expository essay with step-by-step instructions on how to make a peanut butter sandwich. - Write down everything that comes to mind as you can always narrow those topics down later. - You could also use clustering or mind mapping to brainstorm and come up with an essay idea. This involves writing your topic or idea in the center of the paper and creating bubbles (clouds or clusters) of related ideas around it. This can be a great way to develop a topic more deeply and to recognize connections between various facets of your topic. Once you have a list of possible topics, it’s time to choose the best one that will answer the question posed for your essay. You want to choose a topic that is neither too broad nor too narrow. - If you are given an assignment to write a one page essay, it would be far too much to write about “the history of the US” since that could fill entire books. - Instead, you could write about a very specific event within the history of the United States: perhaps signing the Declaration of Independence or when Columbus discovered the U.S.
- Choose the best topic from among them and begin moving forward on writing your essay. Your thesis is the main point of your essay. It is essentially one sentence that says what the essay is about. For example, your thesis might be “Dogs are descended from wolves.” You can then use this as the basic premise to write your entire essay, and all of the different points throughout need to lead back to this one main thesis. The thesis will usually be used in your introductory paragraph. The thesis should be broad enough that you have enough to say about it, but not so broad that you can’t be thorough. Start by writing the thesis at the top and then write a topic sentence for each paragraph below. This means you should know exactly what each of your paragraphs are going to be about before you write them. - Don’t jumble too many ideas in each paragraph or the reader may become confused. - You also want to ensure you have transitions between paragraphs so the reader understands how the paper flows from one idea to the next. Once you have an outline, its time to start writing. Write from the outline itself, fleshing out your basic skeleton to create a whole, cohesive and clear essay. - Revise for clarity, consistency and structure. - Make sure everything flows together. - Support your thesis adequately with the information in your paragraphs. - Make sure you have a strong introduction and conclusion so the reader comes away knowing exactly what your paper was about. - Revise for technical errors. - Check for grammar problems, punctuation and spelling errors. You cannot always count on spell check to recognize every spelling error as sometimes you can spell a word incorrectly but your misspelling will also be a word, such as spelling from as form.